New Page as of 5-29-07! Updated 6-27-07. Healing and Deliverance Resources. Suffering and what to do with it. Fr. Groeschel and Alice VonHildebrand. Programs with streaming video. The Origin and Healing of Homosexual Attractions and Behaviors, from a spiritual and psychological viewpoint. Overview from a psychiatrist who has counseled many people. CMA , applying Christ's principles of faith and morality to modern medical science and practice. From the health page, ALCOHOLISM, "Seven Weeks to Sobriety" book, author Dr. Joan Mathews Larson. Low blood sugar affects many alcoholics, so controlling this with diet reduces their craving for alcohol. Issues on new age theories, gnosticism, the occult, others. Vatican exorcist Fr. Gabriele Amorth warns against Harry Potter. From intouch.org, a listing of life's topics with Scriptures for each. 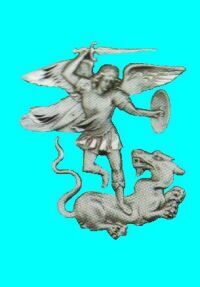 St. Michael the Archangel prayer and another spiritual warfare prayer. Divine Mercy of Jesus Prayer or chaplet. Sexual purity websites, from goodmorals.org. A disciplined mind, thinking Christ-like thoughts, is a good start towards success. Online book "I Saw Satan Fall" by Benedict Heron, OSB, a Benedictine monk.